Here's another song I recorded using GarageBand, this time with my acoustic guitar and a little GarageBand-synthesized piano in the background. I recorded it earlier, it's a little more ambitious, and ultimately I think not as good as Mellow Way. But if you like what I'm doing, let me know. Meditations Number 1 by Jack Humphrey is licensed under a Creative Commons Attribution-Noncommercial-Share Alike 3.0 United States License. I often noodle around on my guitars, and I've started using Garage Band to record these very amateur compositions. This is a little 30-second ditty I composed today that I call Mellow Way. Enjoy and let me know what you think. Mellow Way by Jack Humphrey is licensed under a Creative Commons Attribution-Noncommercial-Share Alike 3.0 United States License. Based on a work at youknowjack.fivewells.com. Empire Online has a fun quiz to see if you can recognize single letters from well-known movie posters. I got 21 -- it's pretty hard, but neat to see which letters jump right out at you. Yes, I'd been to the NY Comic-Con in 2006 and 2007 and had a great time, but of course the NY con lives in the shadow of the legendary San Diego Comic-Con. Now that I'm in LA, I finally got to see what it is all about. So on Saturday, the third day of the con, we woke up early and drove down to San Diego, arriving and checking into our hotel before 10am. We went right over to the con and walked the trade show floor for awhile. Impressive. The big-money booths are fun to look at, but both of us more enjoyed seeing and speaking with the small artists, creators, and publishers that set up in the shadow of the giants. Being an enormous Joss Whedon fan, I insisted we check out the panel for his new Fox show, Dollhouse. We got to the ballroom early to stake out a seat, so we heard the end of Dean Koontz's Q&A, which was very interesting even though we're not readers of his work. The Dollhouse panel started with a trailer, then Eliza Dushku, Tahmoh Penikett, and Joss Whedon came out and took questions from the audience. Joss said some interesting things about the genesis of the show, which was inspired by discussions with Eliza about her life. There was much joking and innuendo (Joss's man-crush/bro-mance with Tahmoh, eyebrow-raising questions to BSG star Tahmoh about Eliza's spine lighting up, etc. ), and they fielded some funny and provocative questions. One fan asked if Joss was worried about the fact that people are already setting up "save the show" sites before the pilot airs. It's true, Whedon fans don't have a lot of love for Fox. After the panel, we hit the floor again until we were exhausted. In addition to all the freebies, I bought an autographed copy of The Lost Books of Eve from Josh Howard, and some excellent DMZ postcards from Brian Wood, which he was also good enough to autograph. I also picked up a fantastic red Scott Pilgrim t-shirt, a Scott pilgrim full-color special issue autographed by one of the guest artists, and a copy of Multiple Warheads, which I still haven't read. I had it in mind that I was looking for an Alex Maleev print (though in retrospect I think I should have been looking for Michael Gaydos artwork), but didn't see anything on Saturday. When we hit the wall, we went up to the Oni Press panel. It was mostly announcements of upcoming releases. I of course was most excited about the announcement of the February release of Scott Pilgrim Vs. The Universe. (Check out Scott Pilgrim here -- it's hilarious.) To be completely honest, though, the panel mostly just provided a much needed nap opportunity. After the panel, we caught up with some friends and made dinner plans, then went back to the hotel for a nap. We then caught a pedi-cab downtown to dinner at a Chinese place. We managed to free-load on our friend's business dinner, which was nifty. Our college buddy M, who is a TV star, joined us for dinner, and it was neat to catch up with him. It was also neat that he then got us into the EW/Sci-Fi Channel party at a nearby hotel. It was like Geek Entourage. I was already skimming along nicely from my two martinis, and shortly after arriving and realizing there was an open bar, I added a tequila shot and a beer to the mix ("oh no" is right). At that point, I started seeing celebrated personages that I admire. The first was Nathan Fillion. 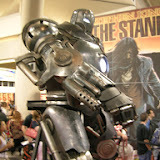 I walked over to him, he introduced himself to me, we bantered about his performance as Captain Hammer in Dr. Horrible. He was very nice and hilariously ebullient. Later in the evening, I happened into another conversation with him that had strayed into the topic of arm wrestling. The man has many opinions on arm wrestling. If you ever see a YouTube video of Nathan instructing you on how to arm wrestle, you have me to thank for planting the idea. Later, I got to meet John Cho of Harold and Kumar fame, who was nice and also a funny guy. Had a great conversation with Hayden Schlossberg, co-writer of H&K, on some of the underlying themes they wrote into the sequel, and how they're approaching #3. Finally, after much prodding from my compatriots, I introduced myself to Joss Whedon. I'm pretty sure I mumbled some fanboy platitudes about Fray, he was gracious, and I politely moved away. It was awesome. Fanboy meets Joss, a great capper to the day. The next morning I managed to get another hour on the trade show floor (hangover and all), picking up some more freebies and buying an autographed Maleev sketchbook (score!). Even by 11am, the Sunday trade show floor was getting ridiculously crowded -- I think worse than Saturday.